Happy new year! I sincerely hope everyone has had a merry Christmas and entered the new year joyfully! 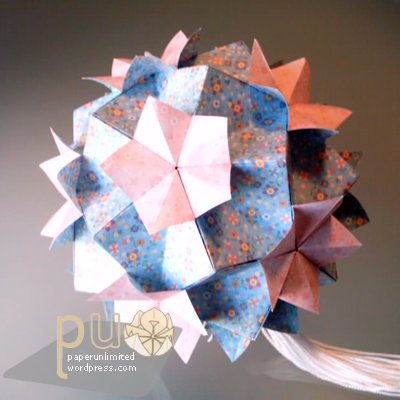 Another remake of a previously showed kusudama. This time I used 7.5×7.5cm/ 3″ double faced chiyogami. Very cute paper. I just love japanese paper, really, it’s just gorgeous… Once again the picture does no justice to the paper. Hopefully that two weeks in February will stretch. A lot! This entry was posted on 2008|01|05 at 17:39 and is filed under kusudama (glued), modular origami. You can follow any responses to this entry through the RSS 2.0 feed. You can leave a response, or trackback from your own site. Wish you luck with other version you are hunting for ! I have also added you to my blogroll, i hope you don’t mind..
first, i love your site! it is very helpful. and second [just in case no one has answered your question yet], korean people do use the zodiac system, and it is the same as that which is used by the chinese and japanese, having a year of the rabbit and no year of the cat.